I have been completely unsuccessful in finding any bagged chips I can eat at my local grocery stores. So I turned to Google to find some oil-free tortilla chip recipes. And here’s what I found! These chips go very well with Tex-Mex Chopped Salad and Southwestern Bean Salad. Preheat oven to 400° if you are not using an air-bake sheet. Preheat oven to 350° if you are using an air-bake sheet. I recommend using a regular baking sheet, not an air-bake cookie sheet. 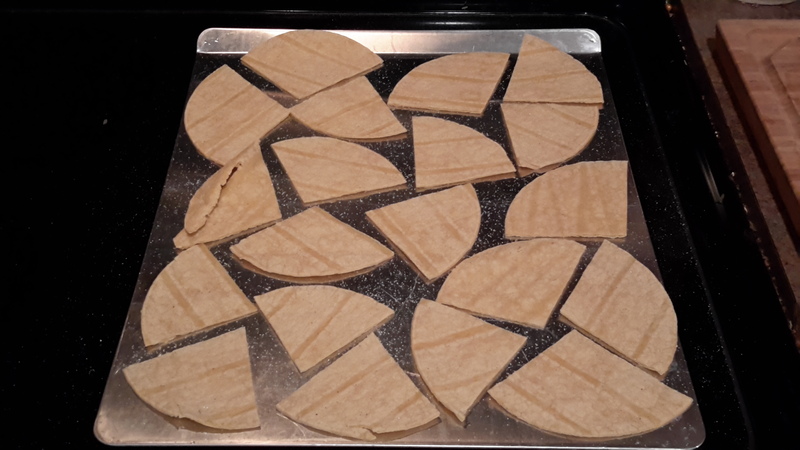 Stack the corn tortillas and use a sharp knife or kitchen scissors to cut the tortillas into quarters. Spread the chips out on a cookie sheet. Make sure there’s about ¼” of room between each slice so they can bend and get crispy. Shake toppings (if using, I recommend at least salt) over the chips. Be pretty liberal with the sea salt if you’re using it. 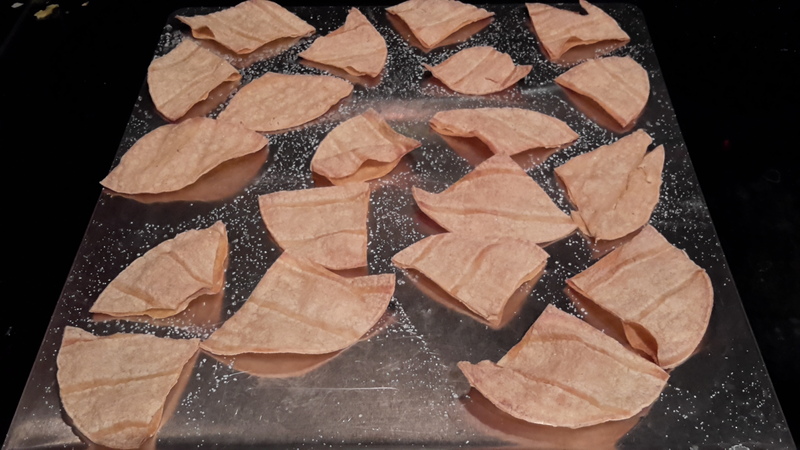 If not using an air-bake sheet, bake for 8-12 minutes until the chips are getting crispy and slightly golden-brown around the edges. If you are using an air-bake sheet, bake for about 20 minutes. Keep an eye on the chips after the 15 minute mark and pull them out when you notice the edges beginning to brown. If your chips are mostly brown, you’ve left them in too long! It’s hard to see in this picture, but the edges are a little brown. It’s easy to see how crinkled the chips become when they are crispy!